Yesterday I got the oil changed in my car. I like dropping these little glimpses of how exciting my life is. It was overdue. That little sticker in the window was yelling at me for quite awhile, because I was way past the time and the mileage was several thousand past what it should have been. But I finally went in, even though I was behind schedule on the maintenance plan. The guy said, “Your oil was really low and really dirty.” And I was like, “Yeah, it’s, um, been a long time.” “Ch, yeah it was,” he said. So I have a choice about what to focus on with this little episode. I can get mad at him for being insensitive and making me feel even more guilty when I already was feeling bad. Or I can get mad at myself, keep beating myself up about how terrible I am for not following the clear maintenance plan that had a reminder sticker right in front of my nose every single time I got in the car. Or I can focus on the fact that actually changing the oil helped my car run better. I’m serious. The engine is quieter. It’s not hesitating when I try to accelerate. Following the plan, even late, helps my car run like it should. Have you noticed there are plans for everything? College students plan out when to take courses and how to fit everything in to graduate on time, sometimes with very complex details that allow, say, a semester abroad for study. Early in our work life we often make a career plan, getting advice on how to move from an entry level position to the dream job we were born to do. As we start getting older, we think about life insurance and 401K’s and retirement planning, all these adult decisions that usually require a financial planner to come in and help us look at our situation and define our goals, and then map out for us what it will take in savings each month to get there. As we get older still, we make out wills and living trusts so that our resources will go to the causes and the people that are important to us; we fill out advance directives ahead of time, making our wishes known about what types of medical care we do and don’t want to extend our lives. All of these plans take at least two things. Usually there is someone there to educate us about different options and help us try a variety of things to get to our goals. And then there’s the discipline, the grind, the effort to follow through and do these things week after week, month after month, year after year in order to turn the plan into reality. If you’re going to run a half-marathon, you need a good plan. A good training plan teaches you about easy days and interval training and tempo and long runs, different types of practice that help develop different parts of your running fitness. You don’t go out and run the 13.1 miles every day and try to get faster at it! You need a good, diversified plan. But you do actually have to, you know, go out and run those workouts for weeks on end before the race. Printing out the plan and sticking it on your fridge, no matter how good the plan, is not going to help your body unless you actually do the workouts. So with all of these plans…an oil change plan, a retirement plan, a graduation plan…doesn’t it make sense that we ought to have a spiritual life plan too? Nope, I want to focus on how much smoother you will function if you DO make a regular spiritual life plan and then follow it. Not like, “Nothing will ever go badly and you will be happy all the time” if you do this. But just like all of these different kinds of plans, regularly practicing diverse activities to encounter God will help you. It will! I noticed something several years ago about running, and made a connection to my life with God. I have this route that I run sometimes that has a gigantic, steep hill about two-thirds of the way through the route. I’m terrible at hills, and when I started I’d be gasping for breath, sometimes walking part of the way. When I got to the top, even the going back down wasn’t very satisfying because I was just wiped out and done. I never recovered. Getting home was just an ordeal. I kept at it, kept running, and I got in better and better shape. But that route with that stupid huge hill ALWAYS has me gasping for breath. Even a couple of years ago, in the best shape I’ve been in, that hill was never easy. It was always hard. When I got myself in shape, even though going up was always hard…I was able to recover. As I came down, still breathing hard at first, I would find my breathing and my legs would recover. My work to get myself in physical shape never made the hill easy, but it certainly did make the rest of the journey home a lot better. I think this is what applies to a spiritual life plan. Sometimes life is just hard. Maybe there’s anger and bitterness in a relationship close to you, or you have to face cancer, or any of a variety of things causes struggle. Just like that running route, there are always going to be things in life, that no matter how prepared or unprepared you are, that are going to have you gasping. What practicing the spiritual disciplines regularly can do is help you recover much more quickly from the trying times. What following a spiritual life plan can do is give you a relationship with God that sustains you and keeps you going over the long haul, in ways that can completely surprise you. It’s like my car yesterday-you’ll find that you can live quieter and steadier as you regularly place yourself in God’s presence and find strength and resilience and transformation occurring. I’ve loved these two little verses from Colossians 2 for a long time. “So then, just as you received Christ Jesus as Lord, continue to live in him, rooted and built up in him, strengthened in the faith as you were taught, and overflowing with thankfulness.” (NIV, Colossians 2:6,7) That’s how I learned it. In high school the reference was screen printed on the back of our youth group shirts, and our Youth Pastor challenged us to memorize it in case someone asked what it was. No one ever did ask, but I’ve never regretted memorizing it. At a really basic level, it is a solid spiritual life plan! It’s got it all there. I want to look at it a little more in depth, and then I want to ask us to help each other with some ideas for a spiritual life plan; for us to share with each other experiences or disciplines that can help us be rooted, built up, and strengthened in our life with God. The first key here is the phrase, “received Christ Jesus as Lord”. This reminds us personally of something incredibly important: life with God begins with each of us making a conscious commitment to make Jesus in charge of our life. I often, as I am today, emphasize the long term day to day relationship with God over the one-time decision to follow Jesus. But as I was reminded in a letter from someone from our church this week, that decision is key! Believing that we can’t do all the good we want to do under our own power, and choosing to accept Christ’s forgiveness and salvation and direction…this is essential! If you have never said to Jesus, “I love you and believe you and I want you to be in charge of my life!” …if you have never done that, don’t miss the chance to tell him today. It’s step one of the spiritual life plan. There’s something else in this phrase that scholars help us see and that I find really important too. “Received Christ Jesus as Lord” translates a very specific and technical verb. It’s one used all through the bible to describe the process of a faith community handing down and passing along the Torah, or the bible, or the tradition of what it means to relate to Yahweh. It’s this great reminder that our spiritual life plan benefits from and in fact requires a faith community. We don’t just do this on our own. We are part of the body of Christ. We learn from those who have gone before us. It’s not only that we personally accept Jesus as Lord, as important as that is. It’s also that others in the community learn and preserve the stories and the practices of life with God, and then pass them along to us. Beautiful! We receive from God through others. What’s also beautiful is that this means we also, as part of the community, get to participate in sharing and teaching and passing it along to others. It’s our privilege and our responsibility to be ones who hand over to the next generation what it means to live joyfully with Christ Jesus as Lord. I love this! Let’s live into this. Then come three ways of living joyfully with Jesus as Lord. These ways are part of shaping our spiritual life plan. We walk with and live in Christ. We are rooted and built up in Christ. And again the community connection, we are strengthened in faith as we are taught by others. Our own Amanda Watson painted this years ago for use in some of our small groups here. I love the image of the roots growing down deep. 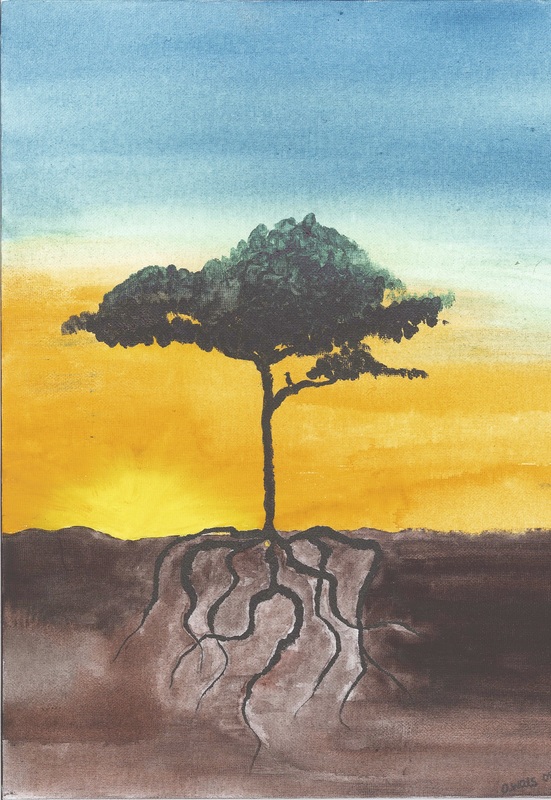 Visually, it helps us realize that those roots have to go down deep to have the nutrients and the strength to sustain the visible, growing part of the tree that we all see. There is no substitute for time and practice in rooting ourselves in Christ. That’s what the spiritual practices or disciplines do, they are how we draw the nutrients we need from God’s soil. I’m about ready to ask us to strengthen each other in the faith, as we teach one another how to root ourselves in Christ and build our lives on him. But first, can I tie back to the training for the half marathon? Trainers have discovered you can’t just do the same workout every day if you want the best results. You have to vary them, try different things. In fact, doing cross training–training that isn’t running but that is something completely different, like biking or swimming–doing different things is the way to get the best race results. Those are not bad things. But there is so much more! Different personalities experience God differently. God is infinitely creative, and finds all sorts of ways to connect with us. Just like doing the same running workout over and over won’t make you the best runner you can be, we need to find variety in how we sink our roots into God and draw nourishment. Now it’s time for you to share. Let’s take a bit of time to pass on to each other the types of regular activities we can practice and try to root ourselves in Christ and build our lives on him. Just like a financial planner will tell you to diversify your portfolio with different types of stocks and bonds and asset classes, we need to diversify our “spiritual portfolio”. I want to close by showing a summary by Dallas Willard of some of the classic spiritual practices or disciplines. You could say that these are the practical ways of digging our roots in Christ that have been handed down, generation to generation, to us today. There’s nothing magical about these, and as you’ve shared today, you can make and adapt your own. But it’s helpful to me to see the major categories here. 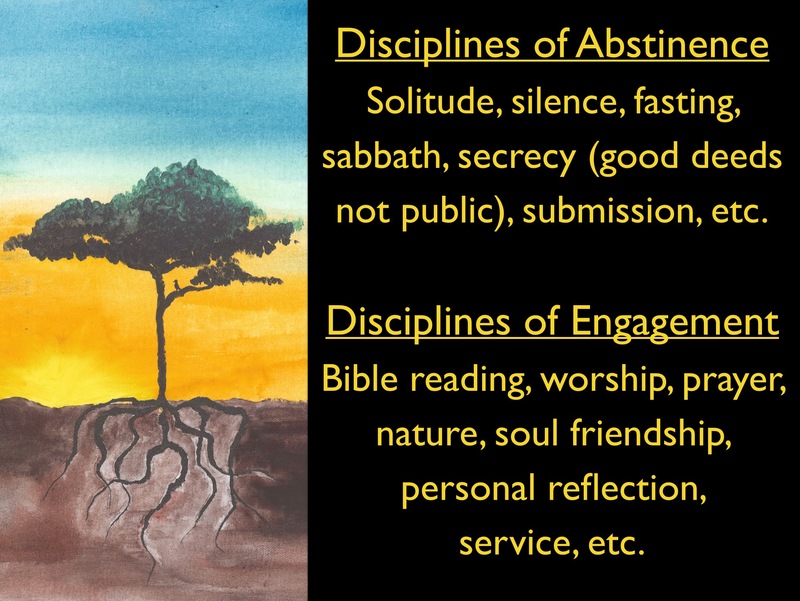 Some of these practices are disciplines of abstinence. They are things we stop doing. Everyone draws nourishment and energy from something, and often we are digging in the wrong places. Sometimes we need to practice stopping some things in order to better hear from God. The other category includes the disciplines of engagement. These are things we do in order to better relate to God, things we positively choose to draw nourishment from the right place. You can see the list of some of the things here to try, but I just wanted to get this up here mainly for us to have the two big categories, abstinence and engagement to help us file away the ideas that everyone shared. Making and then practicing a spiritual life plan is helpful! We can encourage each other to do it. I want to challenge each of us to pick one practice of abstinence, and one practice of engagement to try this week. These practices are ways to dig our roots into Christ, so that we can grow and transform over the long haul. They are the means by which God changes us. 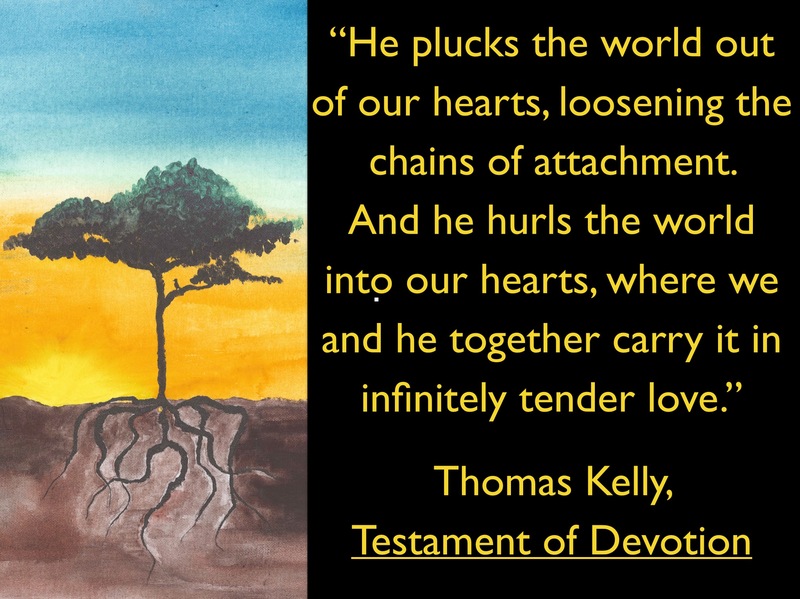 Spiritual practices of abstinence help God loose those chains of attachment to the world. And spiritual practices of engagement help God fill us with infinitely tender love for the world we live in.